The photograph to the right shows the main variations in the hooks through the years. As you can see, the parts 57 and 57a have only one main type, and both were only pre-war parts. 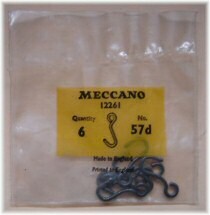 The large loaded hook was introduced in 1922, and remained with minor variations until the takeover of Meccano by Lines Bros in 1964. In the March 1965 price list, part 57b is shown as the large barrel-type hook, but this was changed to 57c in the September price list of the same year, so we can probably assume this was a printing error. Part 57b is not referenced again until 1969, when the Dinky-type hook was renumbered to this part number. The 57b Dinky hook was supplied in outfits 1 and 2 (renumbered to outfits 2 and 3 in 1970) from this point until it was dropped in 1978. Much of this research was originally done by Clive Weston in 2000, by digging through all the known manuals and price lists of the period. A picture of the new hooks in the old-style spaces. Part 57c was originally the small loaded hook, as shown at the top of the column in the photo. These small hooks were also dropped in 1965, to be replaced by the large barrel-type hook shown at the bottom of the same column. From 1966 to 1969 it appears that part 57c was the only hook available as a spare part, described as a Small Loaded Hook, but at the price previously charged for the large hook (part 57b). 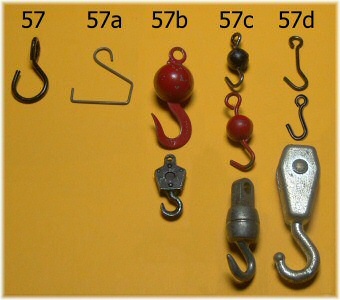 It seems that parts 57b and 57c were inconsistently used in the manuals between 1965 and 1969, referring to the Dinky-type smaller hook and the barrel-type larger hook. In actual fact, the Dinky-type hook was being supplied in outfits 1 to 3, and the barrel-type hook for outfits 4 and above. The outfit 10 of this period contained three barrel-type hooks (not one large and two small as previously supplied). It appears that for a time part 57c was the only hook part number available, but the actual part supplied depended upon the outfit number. March 1964, 57b is large ball hook, 57c is small ball hook, 57d is wire hook. May 1965, 57b is shown as a barrel, 57c not pictured (but remains same price). Sept 1965, 57c is shown as barrel (but prices unchanged, a mistake?). Jan 1966, 57b is dropped, 57c is barrel type at same price as 57b was. Jun 66, Jan 67, Jan/Feb/Mar/Apr 68 all as Jan 1966 (only 57c and 57d listed). Jan 1969, 57b is reintroduced as 'small hook, loaded'. 57c is barrel, 57d is wire. These codes continue and are shown in the illustrated listing of the 70's. For the sake of clarity, then, we will refer to the Dinky-type hook as part 57b and the Barrel-type hook as part 57c throughout. The May 1965 parts lists incorrectly shows the part number, the September 1965 parts list shows the wrong price, but other than that they are consistent. The manuals gradually show a change throughout this period of printing, to the final situation in the 70's that matches our lists. In reality, the smallest outfit contained the wire hook part 57d, the next two larger outfits contained the Dinky-type hook part 57b, and all larger outfits contained only the barrel-type hook part 57c. Part 57d has been used for three distinct parts over the years. Originally it was the plain wire hook as used in the crane grab (part 150), which you can see from the picture is the basis for the later small loaded hooks (with a lead ball formed around it). This became obsolete in 1940. In 1962 the part number was reinstated as a simple wire hook, very similar in design but without the long straight section. This wire hook was supplied in outfit 0 from 1962, but was removed from the parts listing in 1966 when outfit 0 was withdrawn. The part number remained in some model "parts required" listings. When outfits were renumbered in 1970, the new set 1 was effectively a reinstated "set 0" of the 60's, and the wire hook part 57d was included in this outfit. In 1976, the new Crane Multikit featured the new large crane-type hook shown at the bottom of the column. This was originally numbered 57d (in the earliest manuals), but creates its own confusion as this part is shown as part 57a in later versions of the same manual. Now we have the basics covered, let's look at the variations within each part. The simple wire hook part 57 was originally flat from the start of the MME period until 1911, when it became twisted by 90 degrees. Originally plain steel, it became brass plated but for most of the pre-war era it was enamelled black. Part 57a, the scientific hook, is a part from the HSMD. It was designed to hang the small disc weights on. Some versions of this part have the eye fully closed. It is very simple to make reproductions of this part from piano wire, so we have to be a bit careful. DMS/EMP shows the early type of the large loaded hook as black, with the eye very close to the ball. It then states that in 1927 the ball became slightly smaller (9/16'' instead of 5/8''), and both of these are shown in black and red. Very soon after, the ball was lowered on the same hook former, allowing room for the part to be bolted to a strip by its eye. This is partially correct, but not completely. The photograph to the right shows the development of the part. The very first version had the small ball, mounted high up. It was very soon moved down, presumably to allow the hook to be bolted to a strip (as EMP says), and this black version is by far the most common pre-war version; certainly most of the 20's and into the 30's. At a later date (perhaps 1937?) 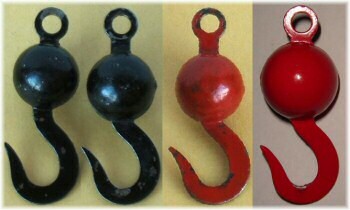 the hook changed to pre-war medium red (third example). The post-war large loaded hook has the ball increased in size from approximately 16mm to 17½mm, with the bottom at the same level as before, and hence the long 'eye' disappears (as the hook uses the same steel former as a base). It's easy to confuse this increase in size with the early parts where the ball itself moved but remained the same size. Most red (and all light red) hooks are like the right-hand version in this photograph. There are occasional oddities, including a version with an even smaller ball, but these may well have been transitional versions or even mistakes. 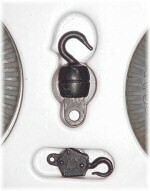 The vast majority of loaded hooks you will come across are the second and fourth in the photograph above. According to DMS/EMP, the early small loaded hook also changed its size, from a 7/16'' ball to 3/8''. It was available in black and red, and another example is shown as having an open eye and a shorter top section. 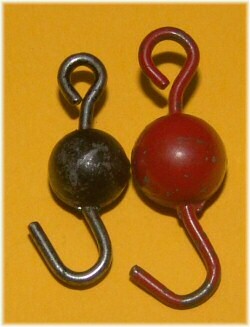 Again, from examples studied here, pre-war examples seem to be the smallest (9½mm ball), in both black and red, but by the mid-50's the size of the ball increases to 11mm and the wire base is longer too. This hook is again available in medium red and (from 1958) in light red. The latest barrel-type hook was originally black, later zinc-plated and in 1975 the sides of the barrel-type hook were flattened. Martin Hanson has dated this change to around 1968. Graeme Eldred points out that this final hook is used (painted yellow) in the Mogul 3299 Mobile Crane. Does anyone know any non-Meccano uses of the Barrel hook? The wire versions of part 57d didn't change significantly, although there are two versions of the later crane hook. Originally the central pin was integral to the hook (as shown on the version in the photograph at the top of this page). Later versions don't have this pin, but have one side tapped to the Meccano thread so that a bolt can be used as a pin. There are various forms of the Dinky-type hook (57c, later 57b), but we have to be careful which ones we assume are part of the Meccano system. Since this part was borrowed from the Dinky line, many parts found in Meccano collections could easily be Dinky parts rather than original Meccano ones. Only unopened outfits can provide definitive answers. Above are boxes of the large and small loaded hooks (57b and 57c), in light red, dating from 1958 to 1964. The colour is identified by the light green labels on the boxes. To the right is a bag of part 57d, the small wire hooks, dating from the 60's. Neils Gottlob's line drawings (where available) can be viewed by clicking the part number at the top of the table. Note: ¹ See 'chronogical variations' above for discussion about the barrel and dinky-type new hook designs. For the purposes of this table, part 57b refers to the small Dinky-type hook, part 57c is the larger Barrel-type hook. Total number of messages on this page: 9. This is page 1 of 2. Incidentally, the missing picture referred to below, 57b.bk, seems to imply that it was introduced in 1915, while the table at the top suggests it was introduced in 1922. Which is correct? I have placed a picture of an apparently early 57b in my gallery. Someone may move or copy it to this page to fill in a missing detail photo. I assume the shorter version of the former on LHS in the chronological picture is 57c.bk, short former, small ball, black; although it isn't illustrated in the Individual part numbers table. Handed barrel hooks : I have 4 of the zinc grooved barrel type hooks, 1 without flats which I believe I bought as a spare in Dec 1979 when I bought quite a few spares to make up for a lack of 5X, 7X and 8X sets - I think this is the one without flats. The other 3, from 3X,8X and Super Highway sets found in HK in 1981-1983, have flats. These are handed. One side of the hook has a slightly raised boss around the hole and on the same side, a moulded raised head of a pin, within the lower portion of the flat (on the 3 with flats). If the hooks are placed with this pin upper most, the flatless and 2 of the flatted have hooks open to the right while one of the flatted is open to the left.